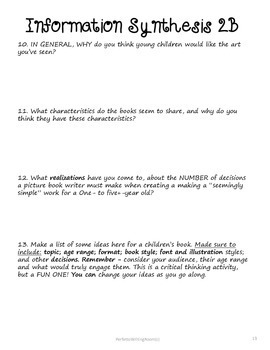 A PerfettoWritingRoom © Special Edition, this special $1.00 taster Lesson helps an instructor of students ages 12-20+ actually learn how challenging it can be, and how many decisions go into writing even something as “easy” as a picture book or young reader. 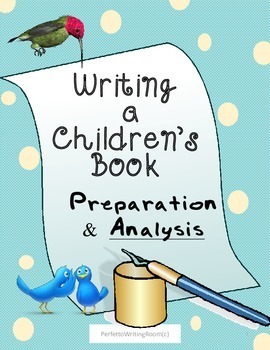 Writing a Children's Book: Complete Project: Grades 6-9-12-Adult..
NOW IN PDF, Easy to open and download! You or your students bring picture books or books up to 1st grade level – award-winning books are best!- and use the PerfettoWritingRoom’s materials which are supplied as follows. for each book they review. - The 2-page Summation and Findings Page – in which students reveal what they have learned. 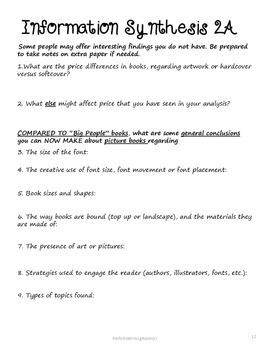 There will be general findings that will prove incredibly useful, and applicable should students move on towards a picture book project, or, a paper in which they write about their findings. As it turns out, there are many decisions that go into making even the “simplest” book. 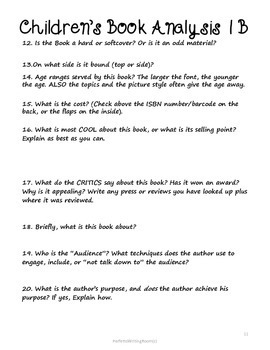 We know your students will discern some guiding principles, trends, or criteria after looking at several books. ***For Your Convenience, we have included a version in "handwriting" in which questions have lines after them, and a version in "computer" in which the lines have been erased. This is a truly unique lesson. Fun, but certainly not Child’s Play. Should you select this hard-working lesson plan. . . . PLEASE CONSIDER RATING and COMMENTING ON IT, or LIKING US! And Thank you for all of the hard work you do today, and every day.